Scorpions do not lay eggs; the female gives birth to about thirty-five young which she carries on her back for about a month. Adults live up to six years in the wild. Shape: Broad, Flat, crab-like bodies with a segmented stinger-tipped tail. Region: Most of the southern and southwestern United States. Habits: Scorpions are active at night, feeding on small soft bodied insects, spiders and other species of scorpions. Scorpions lie in wait and capture prey with their pincers. Habitat: Most scorpions hide outdoors under rocks, bark, boards or rubbish. Inside houses, they may be found in undisturbed areas, like in closets, folded clothing or shoes. Threats: Most species of scorpions are not very poisonous; their stings are comparable to those of bees or wasps. 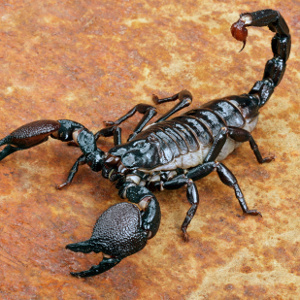 The most dangerous scorpion in the United States is the Wood scorpion which is found in southern Arizona and adjacent areas of California and New Mexico.